See, The Bee Gees weren't ALWAYS "disco" ... way back when they most definitely could have earned a regular weekly spot performing on Lawrence Welk's program ... or even The Andy Williams Show, as they do their pre-Osmonds best, performing this Beatles classic. The funeral service for the late Robin Gibb has been scheduled for June 8th in the United Kingdom. The service is private, for family and close friends only. The Gibb family has encouraged those looking to honor Robin to donate to the Rebecca House and Wish Upon A Dream, children’s charities that were near and dear to the late Bee Gees co-founder. A public memorial service will follow the funeral at St. Paul’s Cathedral in September. Gibb passed away on May 20th at the age of 62. 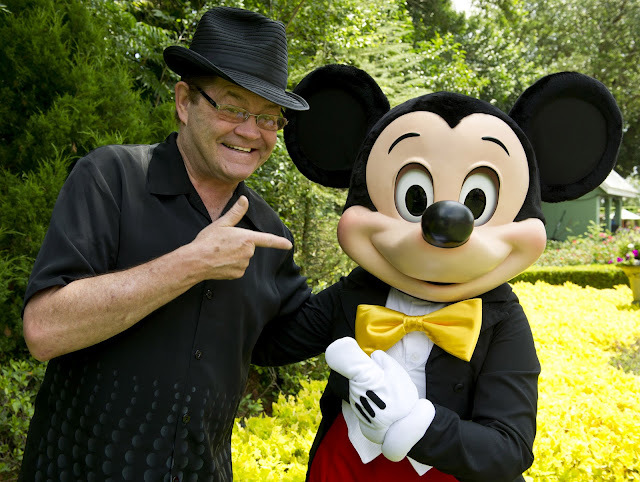 However, contrary to many reports, his death wasn¹t caused by cancer, according to his son. Stars lining up for special tribute to legends Robin Gibb and Donna Summer. Trump Taj Mahal Hotel and Resort in Atlantic City, NJ, will host the 10th Annual DISCO BALL concert produced by Vito Bruno Saturday, June 23 7 PM. DISCO BALL, in its 10th year, is billed as “The Greatest 70s - 80s Show Ever” and this year it will definitely live up to the billing. The show will be hosted by daytime TV star Wendy Williams, “Saturday Night Fever” stars Donna Pescow, Karen Lynn Gorney, and CBS-FM legend Joe Causi. This year DISCO BALL will also be honoring Disco Legends Donna Summer and Robin Gibb in a special star studded line up of the greatest acts of the era. Twelve legendary acts will be performing over 30 hit songs … one night, one stage! Performing live on stage from the “Saturday Night Fever” soundtrack that sold 40 million units: The Tramps featuring Earl Young, “Disco Inferno”, and Yvonne Elliman with her hit “If I Can’t Have You”. Also for the first time performing at DISCO BALL is Heatwave, Melba Moore, Barbra Roy of Ecstasy Passion and Pain, Teri Desario, and Steve Nervo of La Flavour. And, back by popular demand, the fabulous Ritchie Family, Linda Clifford, Rochelle Fleming of First Choice, and Musique. All acts will be backed by MGM Guarnerra Brothers. Get ready to break out you boogie shoes. There will also be a very special appearance by the original dance floor from the movie, “Saturday Night Fever”. Come and dance on the most famous dance floor in the world ... and yes, you are expected to do the famous John Travolta pose. Little known fact: the SNF dance floor was recently featured on Fox TV show GLEE episode titled “Saturday Night GLEEver”. Tickets are available at Ticketmaster. I really disliked disco music. There were only a few songs in the disco genre I cared for(Knock on Wood by Amy Stewart for one). But the Bee Gees disco didn't offend me nearly as much as most of the others. I consider one of their best "The Edge of the Universe" (live version). It came out at about the end of the disco era and I rank that up there with Paul McCartney's Mull of Kintyre. Two great songs that don't get heard nearly enough! 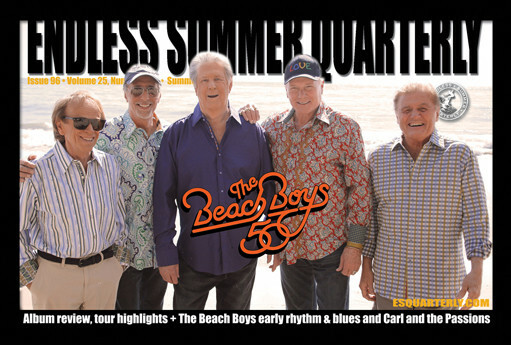 Endless Summer Quarterly just mailed the Summer 2012 edition featuring exclusive coverage of the Brian Wilson, Mike Love, Al Jardine, Bruce Johnston and David Marks on tour; the new studio album, That's Why God Made The Radio; Domenic Priore sheds rare light on the Beach Boys very first recording; a vintage q&a with the Beach Boys from 1972; more … Subscribe today for all of this exclusive content: ESQ. 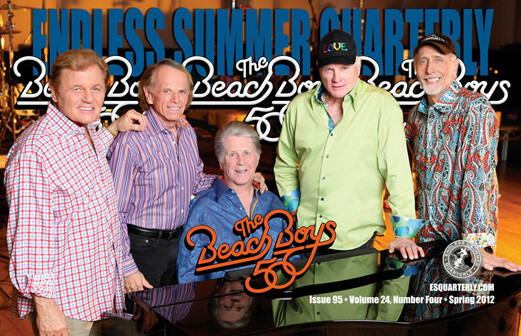 Endless Summer Quarterly kicked off 2012 with exclusive interviews with Brian Wilson, Mike Love, Al Jardine and David Marks about the new studio album — That's Why God Made The Radio — the recording process, working together again and touring; Peter Reum writes about the importance of the Beach Boys music; Andrew G. Doe examines the group's first single; lots of news & reviews!!! Subscribe today for all of this exciting and exclusive content: ESQ. I must say that all of your continued "bad" reviews of my book have caused a monumental amount of sales of my book, and I have inherited an agent as well. This is not what I had in mind when I wrote this book. I was writing what I considered to be a tribute to my favorite singer ... and it was my hope to get the book into the library system as well. So far, three libraries have accepted my book. As an educator, I consider that the greatest honor. And I have no intentions of marrying Frank B. I wrote to him to show I was a good sport. My book is now in the process of being updated / revised due to new tributes now coming my way from people who did not talk to me before. That included three politicians and one member of the Brooklyn Bridge plus more of Johnny's family. Mr. KK, I am shocked at how your website continues to be insulting to me ... and I am not happy that bad reviews are making the sales of my books fly high. I have a television appearance , too, coming up next week in Florida by people who want to hear what I have to say! I think this is getting out of hand. I must have reread this twenty times! Made my day! Enjoy your fifteen minutes of fame, Irene ... glad I could help! And I think it's GREAT that you'll be updating the book. Perhaps more word of mouth will encourage others to speak to you as well, allowing you to tell a more complete story in the near future. And, as I said before, by all means go ahead and gather more loving tributes and memories of Johnny ... and turn this into what I've said it should be ... a fitting tribute to "What Johnny Maestro Meant To Me". My guess is, his official fan club could easily supply another 49 pages for you in a heartbeat! Publicity is a funny thing ... glad we could help, I guess! Just got this from FH Reader Frank B ... a very nice tribute to Mike Stoller, Jerry Leiber, Ben E. King and their timeless hit "Stand By Me". In 1962, Ringo Starr joined The Beatles and the world of music was changed forever. To celebrate the 50th anniversary of this historic occasion, thousands of fans will "Come Together" for a day-long festival of Beatles music on Saturday, July 28, at Ives Concert Park, 43 Lake Avenue Ext. in Danbury, Connecticut. This musical extravaganza is titled "Danbury Fields Forever," a clever twist on the classic Beatles track "Strawberry Fields Forever." The 10-hour festival will feature 10 bands, each representing different eras or presentations of Beatles music. Featured acts will include several Connecticut and New York tribute bands. The Beatles Forever Band is a hugely popular international band that hails from the Hartford area while Fools On The Hill is based in Milford. New York's MerseyBeatMania is the definitive clone band with wigs, outfits, Beatle boots and the exact instrumentation. On the opposite side of the spectrum is Genetic Control, a young psychedelic group that covers Beatle songs in the style of Led Zeppelin. From upstate NY hails Pat Horgan & Thunder Road with their rockin' "Garage Band Beatles" show. Massachusetts will be well represented by The Oh-Nos, showcasing a set of rarer and more obscure Beatles and solo tracks. Paul McCartney will be honored by One Sweet Dream, fronted by soundalike / lookalike Mike Miller. There will be a classical sitar show in opening the event by Roger Lipson, and a very special tribute to John Lennon by world-famous impersonator Carlo Cantamessa entitled "In My Life." The host for the 10-band, 10-hour festivities is Charles F. Rosenay!! !, whose Liverpool Productions has presented the Beatles Expos in Connecticut since 1978. The July 28 music festival celebrating the Beatles' 50th anniversary is open to all ages, and is expected to attract music lovers spanning the generations. Doors open at 10 a.m. and an entire-day "ticket to ride" admission starts at only $15. There will be food and beverages available for purchase. For further info call (203) 795-4737, email LiverpoolTours@aol.com, visit www.ivesconcertpark.com or check out the Facebook events page at https://www.facebook.com/events/372464559479394/ . As The Beatles sang, " ... it's guaranteed to raise a smile!" Now that he's married again, I guess he can't sing "Solitary Man" at his concerts anymore. Tuesday, June 5, will see the release of Texicali, a four track digital collection from ZZ Top that offers the first new studio recordings from “That Little Ol’ Band From Texas” in nine years. The four new songs, available from iTunes and all digital retail outlets, offer a preview of the group’s full-length album, as yet untitled, that will be released on American Recordings late this summer or early fall. Those purchasing the four songs will benefit from a pro-rated discount on the purchase of the full album when it is released. All four tracks will be previewed through an audio stream at Rollingstone.com for one day only, Monday, June 4. These four tracks that comprise Texicali, like the forthcoming album, were produced by Rick Rubin and the band’s Billy F Gibbons and include “I Gotsta Get Paid,” “Chartreuse,” “Over You” and “Consumption.” The first of these is heard in a just-launched campaign for the Jeremiah Weed line of malt beverages that has generated tremendous on-line buzz for the video (youtube.com/jeremiahweed) that depicts Billy, Dusty Hill and Frank Beard performing -- to the delight and amazement of the patrons of a convenience store -- in a walk-in cooler. “I Gotsta Get Paid,” based on the underground 1990s rap song “25 Lighters,” is also heard on the soundtrack to the international box office hit Battleship. The title of the collection is a reference to the locations where the album was recorded. founding of ZZ Top more than 42 years ago and an acknowledgement that the band’s line-up has remained constant ever since. “I Gotsta Get Paid,” is a song that has history dating back to the late 1990s when Billy encountered it as “25 Lighters,” an gritty track from Houston’s rap underground, as released by DJ DMD with Lit’ Keke and Fat Pat. Billy and the band, working with engineers G.L.‘G-Mane’ Moon and Joe Hardy endeavored to deconstruct that song transforming it from hip-hop into blues-based rock-guitar driven song that is certain to rank among the most sizzling ZZ recordings of all time. “I Gotsta Get Paid," along with the other 4 songs that comprise Texicali, will be available from iTunes and all digital retail outlets on Tuesday, June 5. The band embarks this week as the headliner for a six-week “Gang of Outlaws” tour that includes bills shared with 3 Doors Down and Gretchen Wilson. Thereafter, ZZ Top departs for Europe where they will be playing concert and festival dates in Russia, Sweden, Denmark, Belgium, France, Switzerland and Norway in July. Additional North American dates are planned for August and September. All of this activity underscores the fact that ZZ Top continues as a vital force in music today, more than 42 years after its founding and with its ever-enduring line up totally intact. Will return for a west coast swing Labor Day. Last year I saw the Happy Together Again Tour at our local Fair ... It was just announced that Glen Campbell will be performing opening night July 27th at our Fair this year. I hope I get a chance to see him. Mamas And The Papas) in person for a live panel on the story of Monterey Pop after the film! Of course one of the highlights of The Monterey Pop Music Festival was the performance by Jimi Hendrix ... so Hendrix fans should be thrilled with this next announcement! Chicago radio legend Fred Winston is recovering nicely at his home in southwest Michigan. At the start of May, Winston underwent a quadruple bypass surgery on his heart. Well wishes have been pouring in. With his usual dry sense of humor, Fred Winston tweeted: "Thanks for the encouragement everyone. I will celebrate this victory with some apple sauce & seven pills." Favorite Garage Bands - Your Last Chance To Vote! So if you haven't voted yet for YOUR All-Time Favorite Garage Bands, this is your LAST chance to do so! The polls will officially close at 10 PM tomorrow, Friday, June 1st. This is a really great list of finalists ... that's for sure! I will be giving away copies of Those Guys and The Chains. Your readers will need to be real die-hard garage band fans to know either group, but I think they'll enjoy the music. I would have rated the Merry-Go-Round higher had they had more than one lp ... I thought Emitt Rhodes was brilliant. My dad is just now starting to open both of his eyes and move them together!! And he is trying to talk in syllables with his throat! It is unbelievable! He actually answers back to what we are saying. It is amazing that he is comprehending! Still, we have to take it day by day. But it is very amazing that he is finally tracking us with his eyes! I will let you know anything more. Thanks for your message. We just heard that Burton Cummings' mother passed away this past weekend. Naturally, we've been anxiously awaiting his appearance here at the Arlington Heights Frontier Days Festival on The 4th of July ... so it's especially sad to know that he's grieving right now. The beloved mother of former Guess Who frontman Burton Cummings has died. In a post on his Facebook page, Cummings said his mother Rhoda died Friday night shortly after 10 p.m. following a stroke earlier in the week. Cummings, who has been by his mother's side in recent days, credited her with fostering his music career. She started him in piano lessons at a very early age and encouraged his passion for music even when he dropped out of high school. "She was a wonderful, strong woman," wrote Cummings. "My father was abusive to her, and yet way back in the 1940s she had the strength to grab me and leave him." Cummings said there will be no funeral service and asked that no flowers or donations be made in her memory. I just wanted to say I, too, have never heard of the "Forgotten 45's Show" on WJJG. Wonder what we were missing??? In an effort to fix my oldies cravings I have been listening to lots of Herb Kent on V103. He'll pull on some real rare ones that don't ever get played. Also, looking forward to the Jeff James collaboration!!!! I tried to listen to Mike's last program on Saturday ... but had all kinds of difficulties doing so. First of all, neither the Chicagoland Radio and Media article OR the station's own website told what time Mike's show was on the air. Then, after giving it a shot every hour from noon until three, it finally came on ... but the online stream for WJJG is absolutely HORRENDOUS!!! It kept cutting out repeatedly ... and then back-tracking and overlapping with the same material on top of itself ... making it nearly impossible to listen to. So I figured I'd just drive around for an hour and listen to it in the car ... but the radio couldn't pick up the signal for AM1530 either. VERY annoying!!! Mike kicked off his show with some real local flavor ... "Lake Shore Drive" (including a little bit of a "custom version" like Skip Haynes made for us a couple of years ago), "Sugar And Spice", "Vehicle" ... but then he played a couple of things that I wouldn't really consider Forgotten 45's at all. ("Best Of My Love" by The Emotions??? I probably hear that one three or four times a week!) Anyway, I sent Mike an email and told him about what WE do here in Forgotten Hits ... and invited him to join in on the fun. Haven't heard anything back yet, but hopefully he'll check us out and maybe even provide a few tidbits in the issues to come. The Disco Nights circa late 70’s / early 80’s consisted of the gang heading to a Gin Mill for 2 or 3 hours of pounding pitchers of beer & shots. Sufficiently plastered, onward to the dance joints to find pretty ladies. Women in the 70’s looked nice in their dresses at the Discos, but the Guys! What a hideous sight that was! Yeesh! Leisure Suits, Polyester suits, Ugly shirts, Platform Shoes, Bad Flares, Ugly Chains, Permed hair! Christ, What a Mess! It was cooler hanging out with Punks! I just never got into the whole disco scene ... I never played "dress up" in order to fit in ... and, simply put, I didn't dance ... so the whole era was lost on me. It all looked so fake and superficial ... but, at the time, if you were out to meet women, that's where you had to go. I hung out with a couple of guys who were truly into the scene ... as such, I found myself bored, hanging out at the table, most often alone ... it didn't really bother me ... but I couldn't help thinking how we used to PLAY at this joint (or something along those lines). As such, I, too, drifted more toward real rock and roll ... and there was a TON of great stuff coming out in the late '70's and early '80's of that genre ... the stuff we all call "classic rock" today. I was rocking along nicely in the 70's and as a non-clubbing, non-dancing, long-hair, who wouldn't wear the club 'clown suits' but mostly I wasn't happy at all with the 'sound' ... (that ONE pounding beat behind every song drove me nuts)! A musician friend told me of the 'cycle' ... ie ... when rock is needing a 'rest' (not the best material coming out) ... music turns to dance ... and then back again, re-discovered ... (like yo-yo's being popular every other generation) ... original rockers taken over by the dance crazes of the early 60's ... then the folk and rock (with The Beatles leading the way) driving dance out ... and then back again with disco ... and now we have hip-hop. With the information overload these days, you might be able to have multi-formats at the same time (both dancing and listening music) ... but time will tell if they 'split' and we go to less-dancing-listening-rock again. I hated the exceptionally long dance mixes the discos played, too ... take a three or four minute song and stretch it out for 20 minutes of the same, repetitive beat which ultimately just morphed into another song that offered more of the same ... a lot of today's music reminds me of that ... where you can't really distinguish one song from another because they're all made to sound so similar so as to "blend" into this whole listening mix. I guess I've always been more of one for "originality" ... and songs that can stand alone on their own merit. Most of the '60's and early '70's Bee Gees music has been overlooked by radio of late ... you might hear "I've Gotta Get A Message To You" once in a while ... or maybe "To Love Somebody" ... but that's about it. ALL of the focus seems to be on the 1975 - 1979 era of "Main Course" and "Saturday Night Fever" ... and, as such, in many people's minds, that's all they've become ... when, in fact, The Bee Gees contributed SO much more. Do you have occasional flashbacks that are so clear and precise that they could have happened yesterday ... or this morning? I experienced one of those while reading today's FH. I'm certain I haven't heard the song "Mr. Natural " since the spring of '74, but Clark's mention of it transported me to the day we received it and decided to add it to our playlist. I was thinking it was March of '74, so I looked it up to see if I was close. I found that it was indeed March, 1974, and was only on the Hot 100 chart for three weeks, peaking at number 93. We played it for a good six - to - eight weeks. As I type this, I am "seeing" the 45 spinning on the turntable, thinking this should be a big hit. But it wasn't. It's a major IRS, to use Rich Appel's term. By this point The Bee Gees had fallen off the radar a couple of times already ... their last really big '60's hit was "First Of May", which reached #18 in the Spring of 1969. We wouldn't hear from them again in Chicago until late 1970 when "Lonely Days" shot up to the top of the charts. It was a WHOLE new sound ... and I LOVED it. A few more Top 20 Hits followed ... "How Can You Mend A Broken Heart" (#1, 1971); "My World" (#15, 1972) and "Run To Me" (#11, 1972) ... and then they were gone again until "Jive Talkin'" took them back to the top of the charts in 1975. Being COMPLETELY bowled over by the "Main Course" album ... (it remains to this day one of my all-time favorite LPs) ... I was naturally curious to see what took them there ... what had I missed between the lushly produced and heavily orchestrated "Run To Me" to the unmistakable beat of "Jive Talkin'" ... so I picked up a copy of "Mr. Natural" to see just what kind of stepping stone it really was. Try as I might, I could NOT get into this album ... it was COMPLETELY lost on me ... and I found no appeal whatsoever between the grooves ... making the brilliance of "Main Course" even that much more dramatic to my ears. And they kept it going ... from "Children Of The World" to "Saturday Night Fever" to "Spirits Having Flown", The Bee Gees stepped into a zone of non-stop success ... pretty amazing for a band that had already been around our consciousness for a decade! But my how they had changed. After a successful run of winter shows, groundbreaking vocalist, songwriter and bass player TIMOTHY B. SCHMIT -- well-known for his work as a member of the EAGLES and Poco -- is gearing up for a Spring U.S. Tour with his band starting May 19. For the three-week trek, TIMOTHY and his full band will perform songs from his fifth solo album EXPANDO as well as gems by the EAGLES and Poco. "What I like best about doing solo shows is it gives me a chance to interact with the audience in a smaller, more intimate setting. But, don't get me wrong. I very much enjoy being a part of the Eagles and all it implies. For instance, as of this writing, I find myself in a hotel in the exotic city of Dubai where we (the Eagles) will end a short tour that started in South Africa. After a few more scattered shows in the U.S., I look forward to taking my own band out on the road and having a completely different experience. I'm a fortune man. I get the best of both worlds." 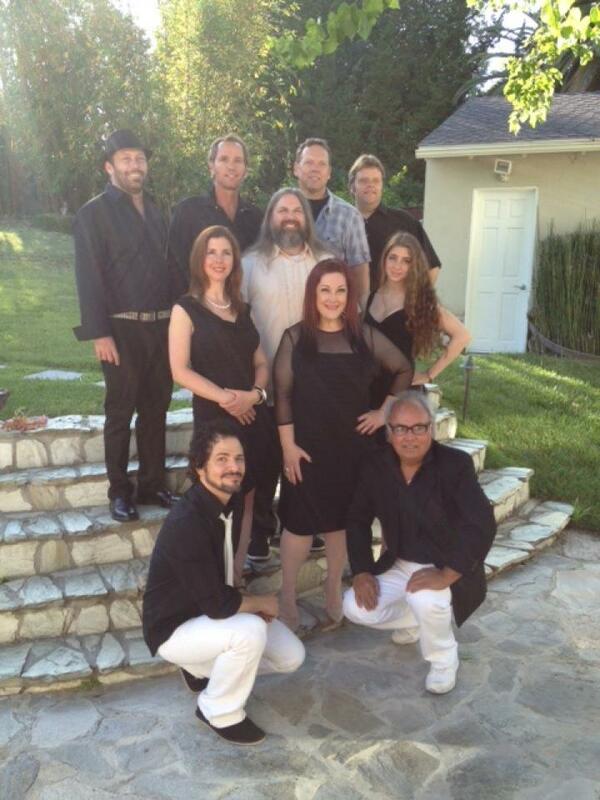 The spring trek will take TIMOTHY and his bandmates to clubs offering an intimate vibe. See above for a full list of dates and details. Hope you're having a pleasant holiday weekend. (Bristol Stomp, You Can't Sit Down, Bristol Twistin' Annie, Hully Gully) on bass and vocals. I've know them since I mc'd the opening act for their / our 1975 Steel Pier (Atlantic City) show when I led the Jill Babylove (disco) band. The Rip Chords, which I also led, were / are in the same management office so our friendship grew. It's nice to be out there playing once again in this arena. I played my first show with them on May 20th and I'm looking forward to a good summer. I think your daughter did a great job on Beach Boys review. You should give her a raise in pay . LoL !! I'll get you in trouble if I keep writing. You just gained a ton of additional credibility for shooting straight with us on Irene's "book". Here's something for Motown fans to rejoice about -- Diana Ross' legendary Central Park concert from 1983 has finally made it to DVD. The disc is produced by Shout Factory and includes both days from the event. Day 1 of her free concert was rained out, and she promised to return the next day to finish the show. Indeed she did, causing herself to foot the bill for most of the unplanned second day. At last, both days can be seen on the DVD set. And now fans of Diana, Mary, and Florence have something more to add to their lists ... The Supremes At the Copa is finally released by Hippo-Select as an expanded 2-disc set. The legendary appearance by America's top group of the 1960's marks the only live album from the group's "classic" line-up. Just listened to the new Eric Burdon track. It sounds like "Take The Long Way Home" to me. No? Just listened to Eric Burdon's "Memorial Day" again. "A rich man's war, but the poor will pay." Reminds me of "Sky Pilot."